My in-laws were coming over for dinner last weekend and my father in-law mentioned a while ago that he likes stuffing. I saw that I had a box of dried bread chunks buried in the cupboard, for hurricane season, and I figured why not, even though it really doesn’t go with BBQ chicken I was making. So here is how I did it. 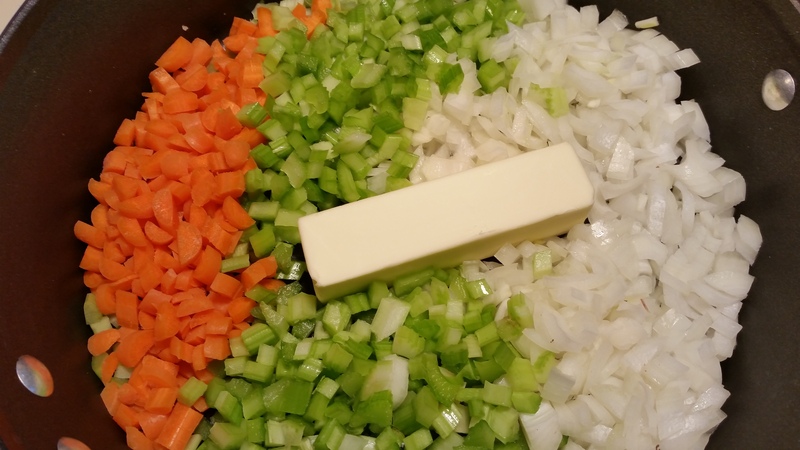 As you can see that is a whole stick of butter along with two tablespoons of salt and pepper, a white onion diced, five stalks of celery diced and a few carrots diced up also. Cook over medium heat until the vegetables begin to soften. 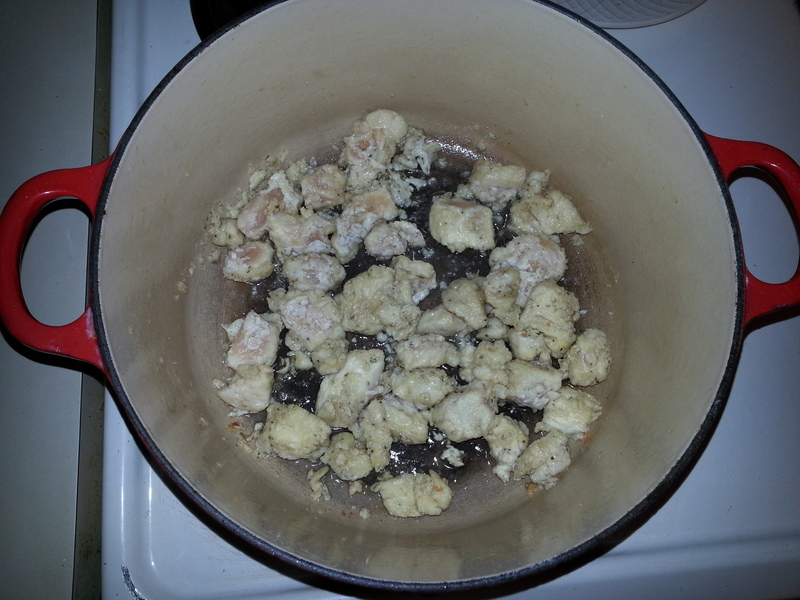 Add two cups of chicken stock to the pan along with two tablespoons of Bell’s seasoning. Now take the mixture and pour it over the bread chunks, mix gently and you will notice it will be a little wet, this is fine because we are going to cook it tomorrow afternoon. Let it cool on the counter top for about an hour, cover it with foil and put it in the fridge for later. 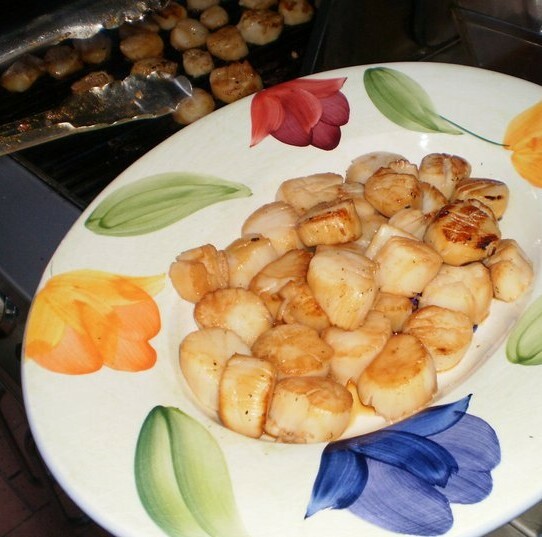 When it comes time to cook it, place it in a 300F oven for about forty minutes to an hour or until it reaches 145F in the center of the pan. 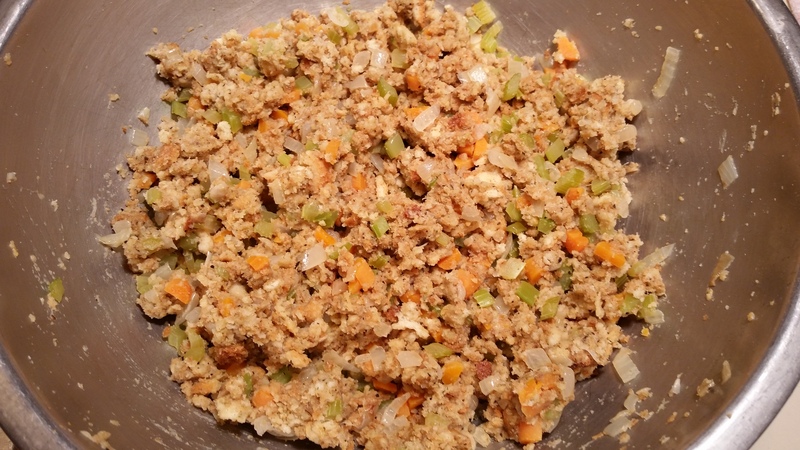 You will have moist fluffy delicious stuffing to accompany your meal. I know that there was a request for this item a while ago but I had to track down a Jamaican woman that used to work for me who made this dish and it was always really good. So here we go. 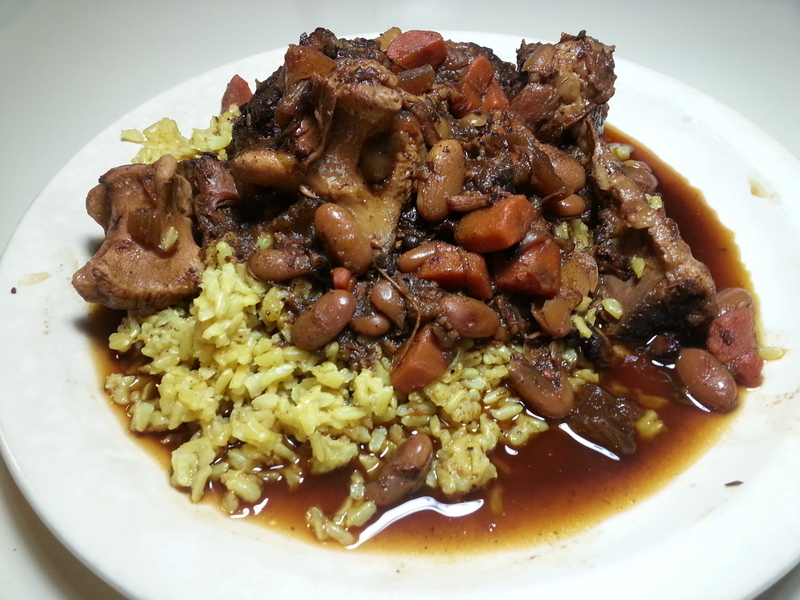 My take on oxtail stew. Start with 2.5 to 3 pounds of oxtails washed and dried and dredge them in a mixture of 50% flour 50% sugar and sear them in a hot pan on all sides. When done set aside for a few minutes. To the hot pot add 2 chopped onions, 2 chopped carrots, 2 stalks of celery, 2 Tbsp of chopped garlic, some fresh thyme, 17 whole allspice, and I had a scallion kicking around the refrigerator, so I threw it in too. Cook together making sure to scrape the bottom of the pan. 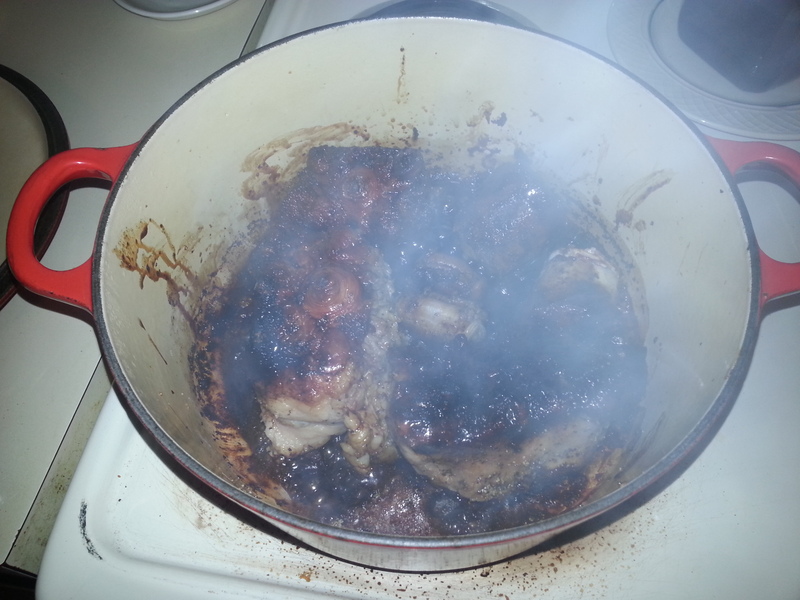 Put the meat back into the pot and the juices. Now add ½ cup of red wine, 2 cups of water, a quart of beef stock, 3 tbsp of soy sauce, 3 tbsp of ketchup, 2 tbsp Worcestershire sauce, 3 tbsp brown sugar and one whole scotch bonnet pepper. 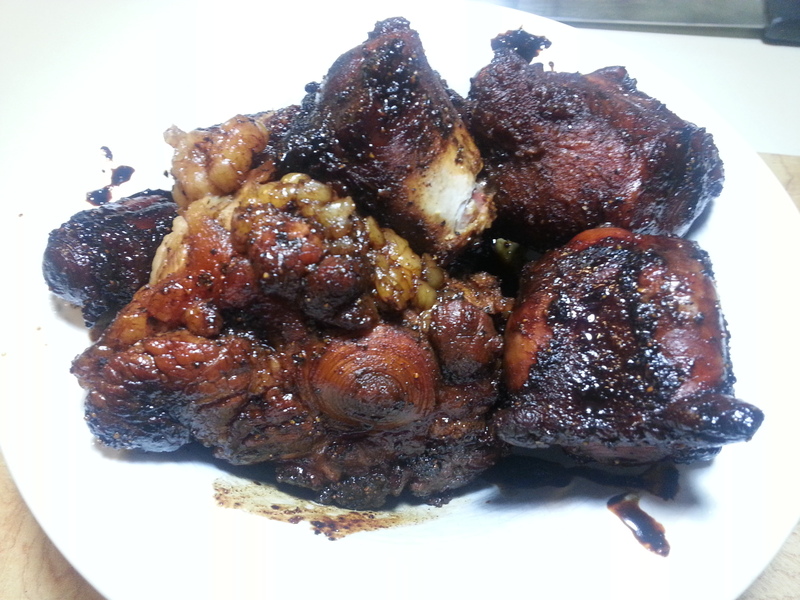 Even though I had 2, I only used one, being this is the first time making ox tails. 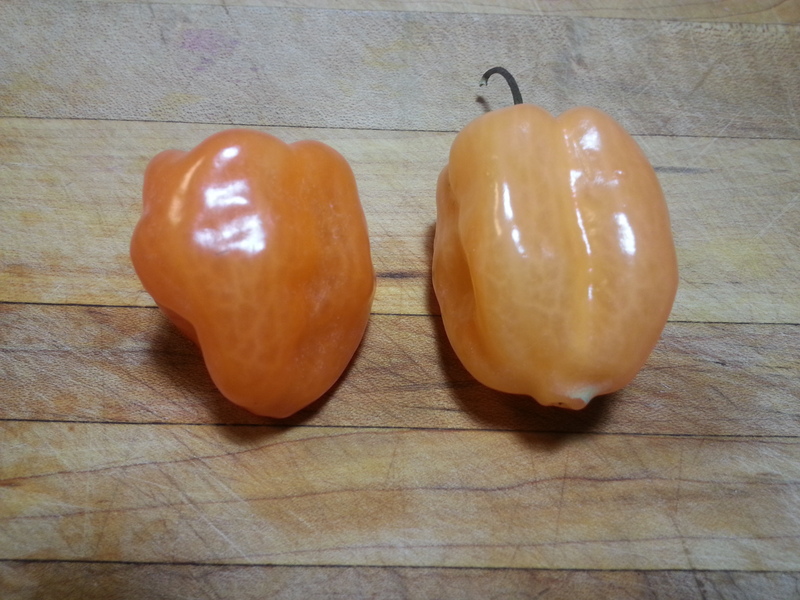 In retrospect, I should have used them both for more spice. Here is the easy part, put the lid on, turn the pot down to the lowest simmer your stove allows and let it cook for the next 4 hours. 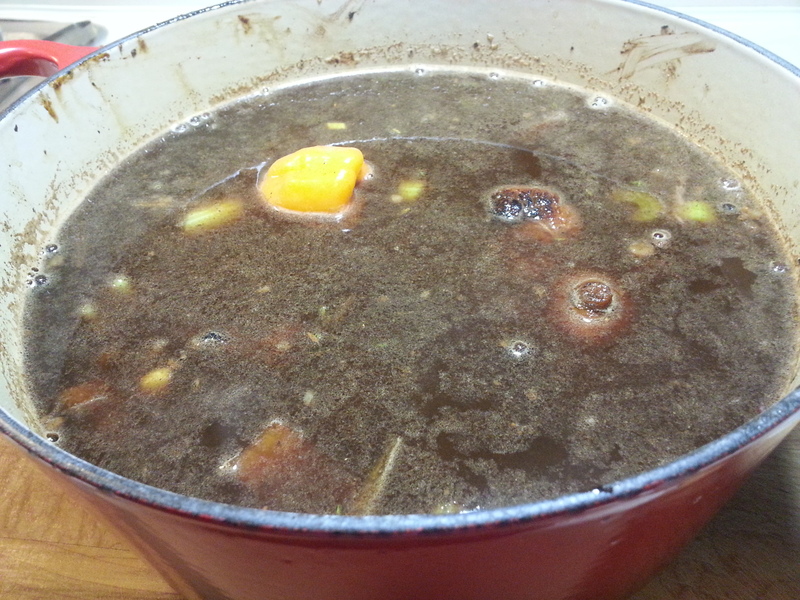 Stir once in a while and you will see the broth reduce and thicken by itself. Now add 2 cans of drained and rinsed cannelloni beans, stir them in and let simmer uncovered for about an hour. About this time make some rice to serve with the stew. I made brown rice in this case. This dish made the house smell so good. When eating just watch out of the little bones, the meat is tasty and just falls off the bone. So sit back, grab a bowl and Enjoy! There was a “cold front“ that came through Florida last week and as a tribute to my wife’s New England upbringing I thought I would make my version of chicken pot pie. So I started poking around the fridge and here is what I came up with. 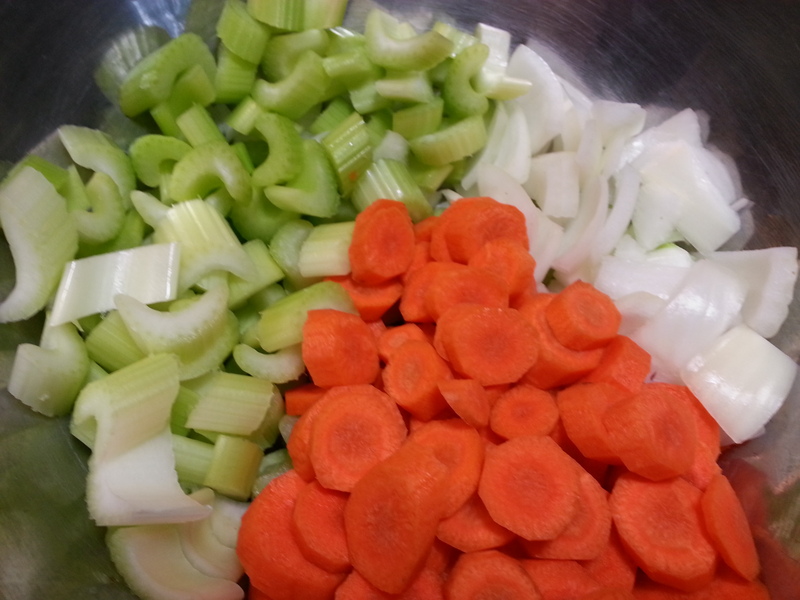 1 large onion, 3 medium carrots, 3 celery sticks all chopped into medium pieces and set aside. 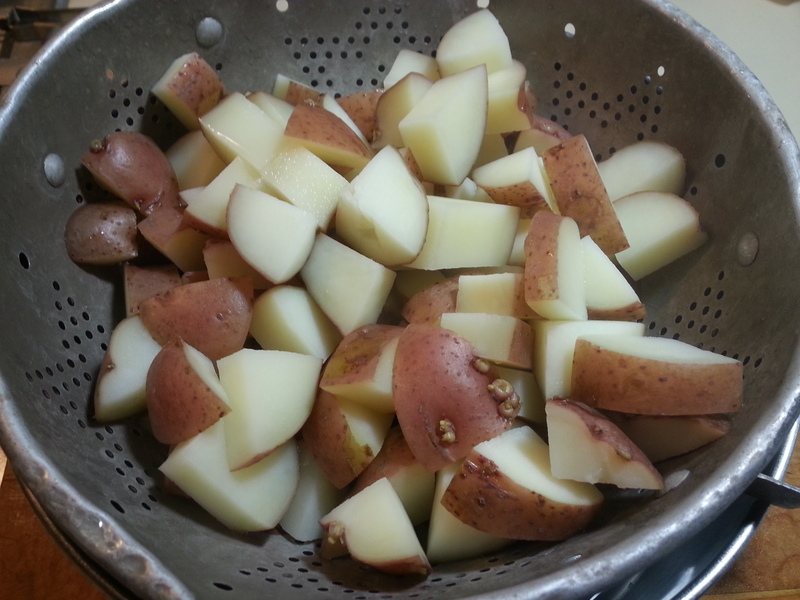 Cut 4-6 red potatoes into small pieces, boiled them for about ten minutes then tossed them into some ice-cold water to stop the cooking because we are going to cook them again with everything else. 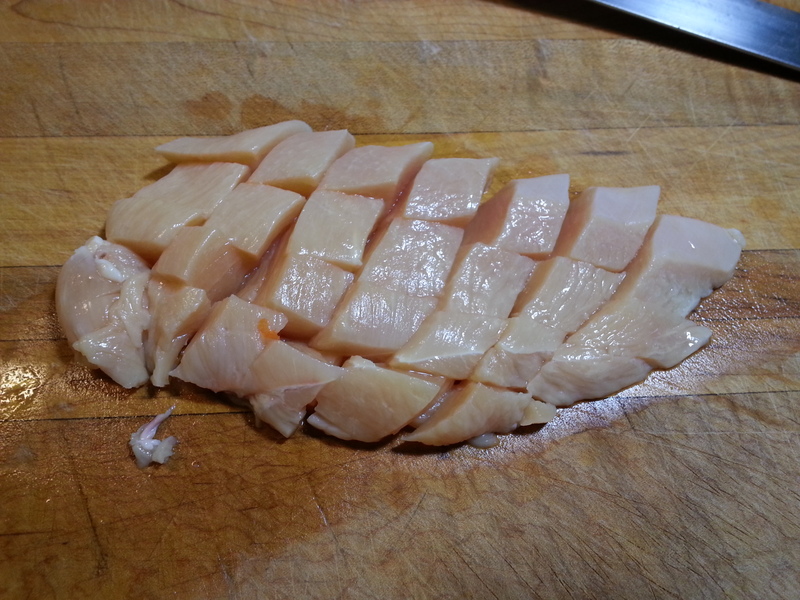 Start with four 6 oz chicken breasts and cut them into uniform chunks like in the picture. 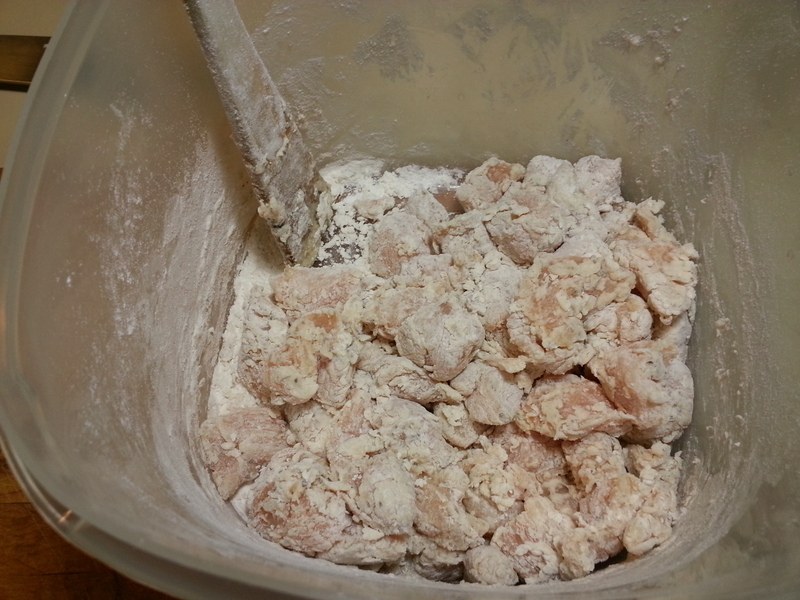 Dust them in some seasoned flour and sear them off in the pot you will be making the stew in then remove and set aside on a plate. Now take the vegetables you already cut and sauté them with some garlic, when soft add the potatoes and the chicken cook for a few minutes. Add a quart of chicken stock or broth and a cup of heavy cream. Reduce the heat to simmer and let cook for about an hour uncovered, stir occasionally to make sure nothing sticks to the bottom. 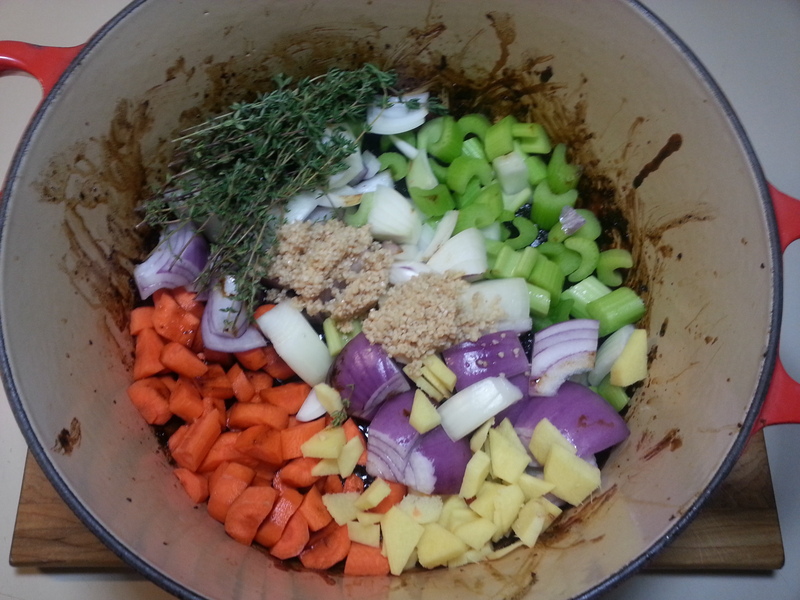 It will thicken as it cooks and makes the house smell really good. Before serving, taste and adjust the salt and pepper to your liking. As a side note, by using the potatoes instead of puff pastry you are saving some calories so you can have another bowl or two. My in-laws were coming over to help finish up the bathroom remodeling and I wanted to make something for dinner that was different from anything I have ever made for them. (This has become a personal challenge.) So off to the kitchen I went to see what I could do. So we had some ground turkey meat in the fridge. 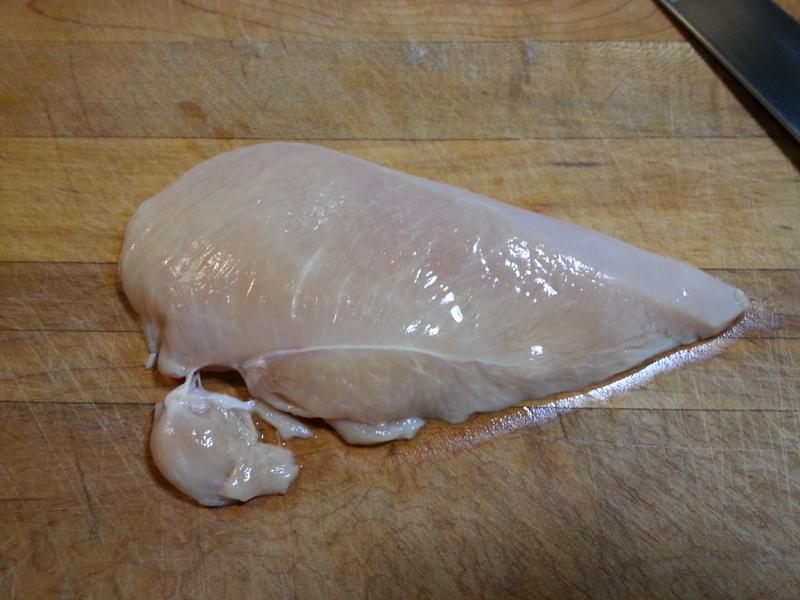 Lately, my wife has been eating more poultry because she doesn’t want too much beef. So tonight was going to be turkey burgers. Now what to do about a side dish. I found some broccoli stems left over from a chicken and pasta dish I had made earlier in the week. There was also carrots and red onions. Looks like we were making a vegetable slaw. I took the ground turkey and mixed it the garlic, Italian seasoning, salt and pepper. Be careful not to over-mix as this can dry out the turkey. 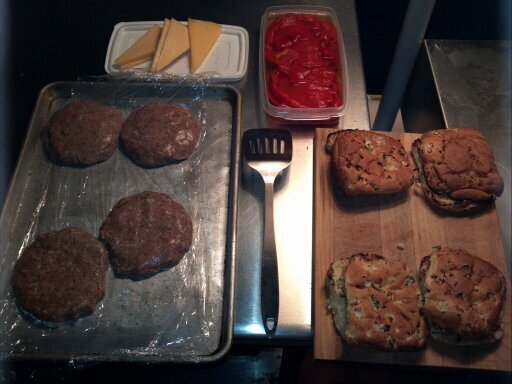 I then portioned the burgers into 8 oz patties, making sure to form them into disks. I pushed in the center so that when it cooks it would prevent the meat from turning too much into a ball. I wrapped them with plastic wrap and placed them in the fridge. Now to prep the slaw. In a bowl I mixed together the mayo, lemon juice, salt and pepper. 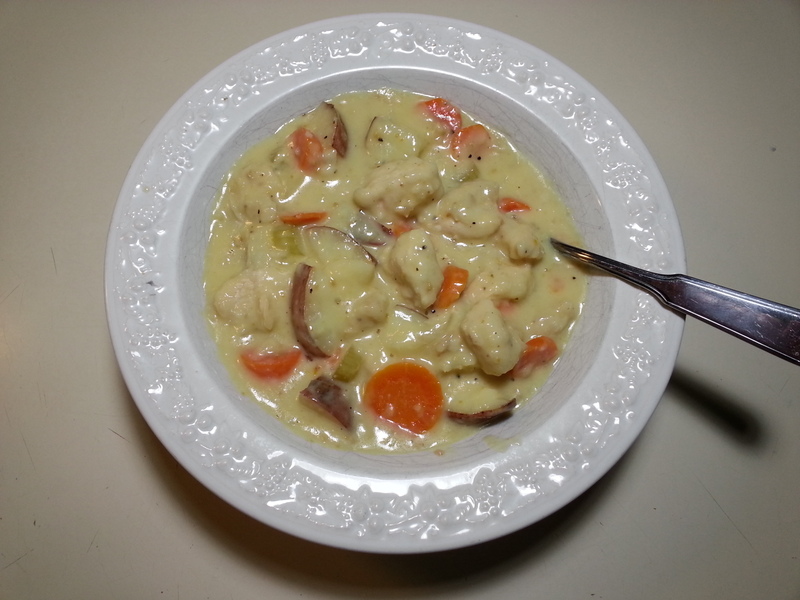 Mix in the broccoli, carrots, and red onions. Cover and place in the fridge. 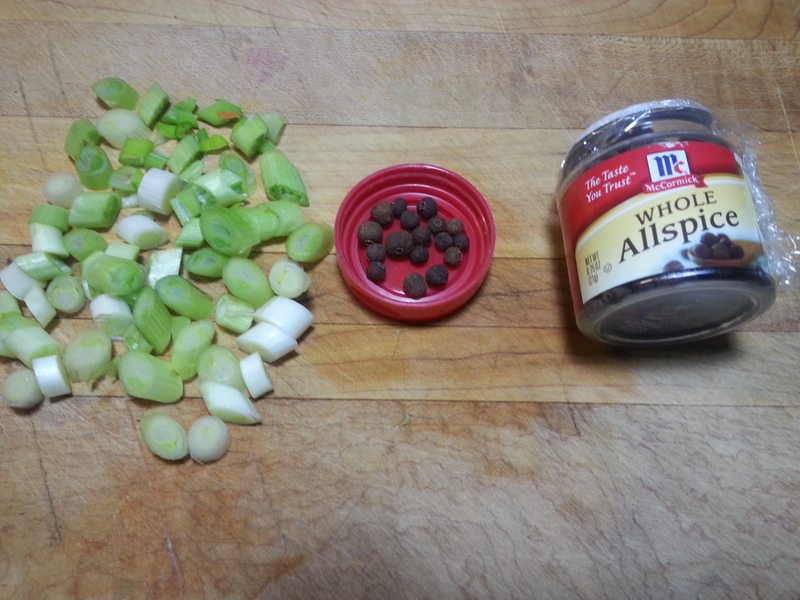 When it was close to eating time, I pulled out all the ingredients and prepped my workstation. Ingredients prepped next to the grill. It was night, so it was dark out. 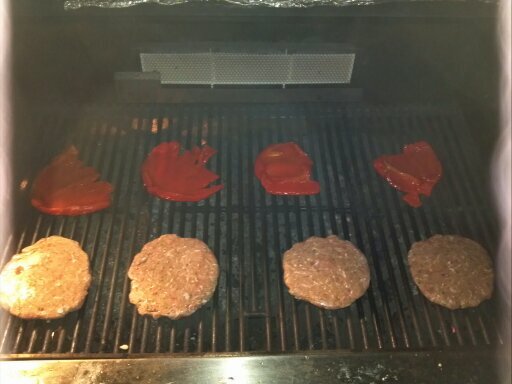 Grilling the turkey burgers and roasted red peppers. Grill the burgers, about 8 minutes per side. Make sure the internal temperature reaches 165F. Place on the roasted red pepper and smoked Gouda. Place the roasted red peppers on the grill to put a slight char on them. 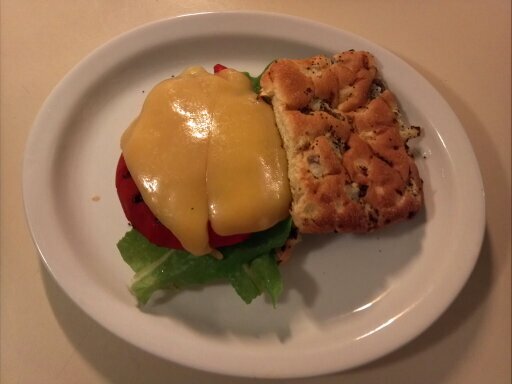 Place lettuce on the onions buns and top with the burger, roasted red pepper and smoked Gouda. Make the burger. No condiments necessary. 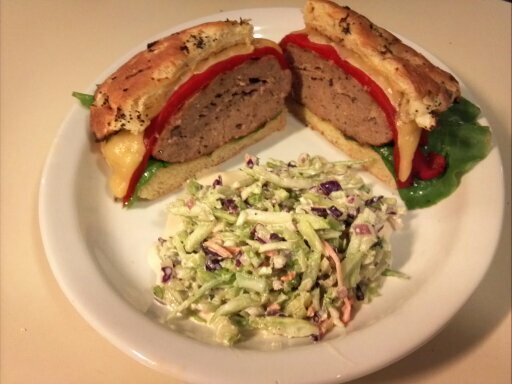 Served with the broccoli slaw, this burger was a big hit. Try something different for the summer!